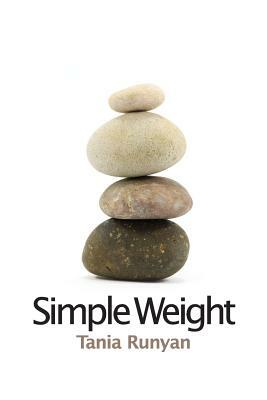 With consummate skill, subtle and exacting artistry, and fierce passion, Tania Runyan's first collection, Simple Weight, brilliantly unveils the mysterious ties tethering heaven to earth and] explores the painful and troubling journeys of a soul in search of the divine.... Hers is a voice brimming with a palpable humanity and beautiful pathos--complex, wise, mutable, and wholly original. --Maurya Simon, author of The Raindrop's Gospel __________ Spiritual without being in the least bit preachy, Runyan deals in matters of the heart, letting us experience the ineffable through a variety of subjects, often commonplace objects: a dead goldfish, a broken dishwasher, dust mites.... Runyan uses deeply infused language throughout: "I chew the name God, God like habitual / gum." God, "the holy / singularity." "God who buries // his miracles in the soil." These] poems have weight--emotional, spiritual, political--but are anything but simple. --Barbara Crooker, author of Radiance, Line Dance, and More __________ Tania Runyan claims she does not concern herself with things too marvelous for her. Well, she's lying. Simple Weight ponders and illuminates cicadas emerging from the earth and martyrs merging their bones with dust. In Runyan's world--which is our world--the human intrudes upon the holy, making it more holy still. These poems, like the Psalms themselves, will fall through the years "like a muscle of water." Drink deeply. --Paul Willis, author of Rosing From the Dead: Poems. Tania Runyan's poems have appeared in Poetry, Atlanta Review, Indiana Review, The Christian Century, Willow Springs, Southern Poetry Review, Poetry Northwest, and others. Her chapbook, Delicious Air, was awarded the 2007 Book of the Year Citation by the Conference on Christianity and Literature.